Lamborghini has been the most vocal car maker in the world when it comes to saving the V12 engine from oblivion. Retaining a naturally-aspirated twelve in its Aventador has given the brand a powerful USP at a time when rivals have turned to turbochargers for better performance and reduced CO2. Word is that the Italian brand has every intention of retaining a non-force-fed V12 in its Aventator successor, and while the adoption of hybrid assistance seems almost inevitable, it should mean ferociously responsive V12 power will remain a feature of supercardom for many years to come, thanks to Lambo. The Miura was, of course, the car that tied the knot between the firm and a dozen-cylinder engine way back in 1966. The gorgeous two-seater used a midship-mounted 3.9-litre V12, and was successful enough for each of its successors to receive an evolution of the same unit. When the Countach arrived in 1974, its V12 engine was of the same capacity and, with 370hp, produced only 25hp more than the original Miura. The Countach's exterior couldn't have been much more contrasting, but the formula beneath was clearly inherited. While the Miura provided Lambo with its technical formula for years to come, the Countach set a trend for its design direction - see Aventador SVJ as the most recent example. Marcello Gandini, an automotive designer from Bertone, was the man responsible for the Countach's angular lines - and interestingly, he was the person who'd given the Miura its pretty, feminine shape prior to that. Where the Miura eschewed the rounded shapes of performance cars from its time, the Countach too ignored established traditions and looked like something out of science fiction. 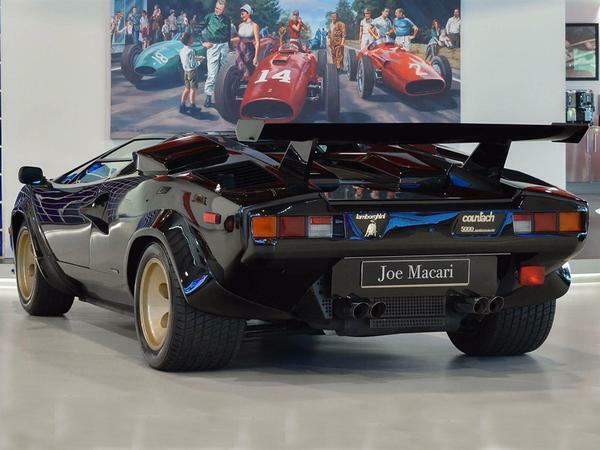 The wedge nose, pop-up headlights and ultra-low roofline of early cars were familiar, but the details - like those rocket-booster-mimicking air intakes, the twin-buttress rear deck, not to mention the motorsport-esque single wiper and naca ducts - took the Countach to a new, more adventurous place. When a large, fixed rear wing was added and the wheel arches grew wider, the original Countach's delicate design was arguably lost. But to many - particularly those of the teenage boy variety - the coolness of Countach went off the scale. 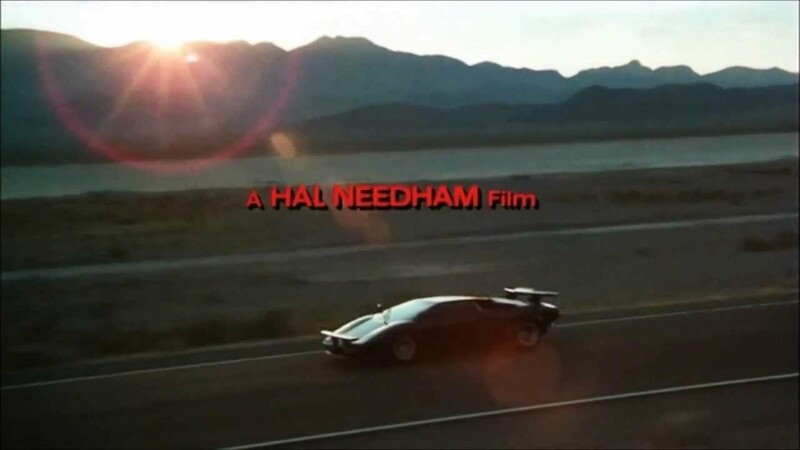 Its title of 1980s supercar poster-filler was set in stone, so much so that how it actually drove was virtually a side issue. Nevertheless, the Countach was appropriately special in real life, too. Slipping beneath its scissor door and into the low-set seat, with the sight of those intakes in the mirrors and wheel arches either side was as exotic as automotive experiences came. It was also typical of a retro Lambo, because the pedals and wheel were offset, so you sat with a twist in your body to reach the controls that sat left of centre while rear visibility in later cars was almost completely eliminated by the rear wing, so attempting to reverse park in one was like doing the backstroke. But it must've been hard to care, given the superhero status it imbued on all those driving it. Later cars got a larger 4.8-litre 12-cylinder, still related to the Miura's heart but with modern additions to increase power beyond 400hp, making the Countach supremely fast for its day and every bit as ferocious as that wingthings further still, increasing engine capacity to 5.2-litres to provide the Countach 5000 Quattrovalvole - named as such for its use of four valves per cylinder - with 455hp. Along with the new valve design and greater engine size, the boost was enabled by the use of six Weber Carburettors, which were located atop of the engine instead of to the sides for better cooling. This encouraged the fitment of a raised engine cover, restricting rear visibility even further. At the time, America was Lamborghini's most important market for the Countach, with sales there surpassing all other regions. 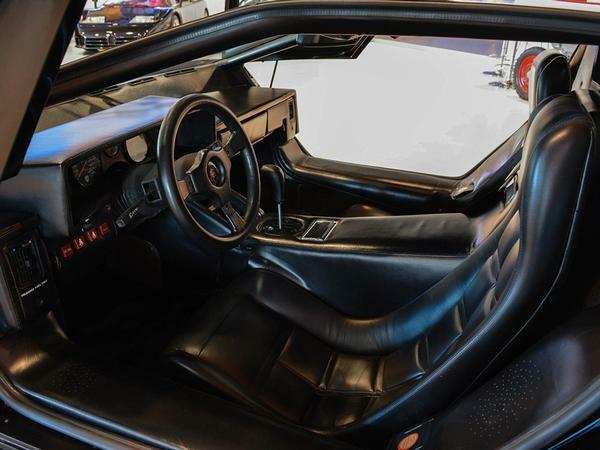 But the US's more stringent regulations for safety and emissions meant that the Countach was forced to wear a set of thick bumpers, basically black plastic segments that were added to the front and rearmost panels, and the QV version also had to trade carbs for Bosch K-Jetronic fuel injection. Presumably because the V12 engine was originally developed for carbs rather than the more modern injection system - or perhaps because it needed some detuning to meet US regulations - the 5.2-litre now produced 420hp. Just 66 QVs were produced in this specification, making them almost ten times rarer than the Euro-spec carb cars and probably more mechanically reliable to boot. This week's Showpiece is a former California car, so it comes with the American fuel injection engine, although mercifully it has been converted to European bumper-free form. Finished in black with bronze wheels, it looks stunning, and with a recent engine rebuild, apparently it runs like new, as well. The car arrived in the UK in 1991, which is when its extensive service history begins, with constant maintenance and work carried out since and the paperwork to prove it, culminating in a receipt for a £25,000 engine rebuild. 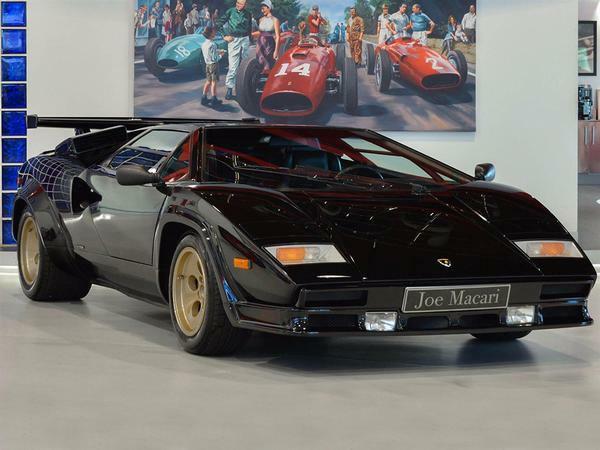 Considered alongside the 15k on the clock, this has to be one of the finest examples of Countach on the planet - which might help to explain why it's up for sale on PH at £350k. Probably why I'm into cars. Would prefer an LP400 these days, naturlich. ^^ This had a profound effect on me as a young'un, the amazing sound as it took off past the cop car and buggered off over the horizon. It is my all time favourite car. Love these cars, sat in one in the late 80’s and was blown away by it. Definitely my Athena Poster car of the 80s. In 1985, the first QV arrived in the UK. It did the rounds, with the press driving it (Autocar gor 178mph and 0-60 in 4.8 if I recall). It made its way to Scotland where I encountered it. I was 17, with my driving licence still fresh from the printers, and my father took me one Monday evening to Perth, where it sat behind a pane of glass in the only Lambo dealership outside of London. My father asked, "want to have a go in it?". I laughed at his preposterous question, but he then said, "I'm serious". Turns out that the car had to be returned to Portman Lamborghini in London, and with the dealership owner (a friend of my father) then serving some taxi time due to a driving ban, the issue of how to get it back was discussed. My father offered to drive it down. Offer accepted. 17 year old slightly excited as a consequence. I was at a friend's house the day after. He too was - naturally - a huge Countach fan. I heard/felt a rumble and said, "Oh, that's my father with his new car". Out we went onto the street, and my friend's jaw dropped. We spent the whole evening picking up friends and family and rocketing about Perthshire on short jaunts (all sensibly driven, m'lud). On the Wednesday, we drove to the outskirts of London. In, err, 4 hours and 30 minutes. From Central Scotland. The roads were quieter then. Too many incidents to talk about, but two stick in the memory. The first was the fact that a new shape Astramax van (the aero one) tailed us for about 50 miles. It's true what they say about white vans! Blueprinted engines, I swear. Secondly, the woman in her Porsche 911 Targa sweeping imperiously onto the M6 motorway at Jn 6, Birmingham, and aggressively cutting her way across the lanes....until she met us in the outside lane. At that point, my father, pre-warned about Mrs Yuppie, floored the throttle. The world - and the 911 - receded rapidly in the slit of the rear window, never to be seen again. I did drive it a little on a private road. In first gear. The clutch and brakes were stupidly heavy. The car had such presence, with the most glorious engine noise, especially after 4000rpm. Its grip was astonishing. Crossing the central reservation in roadworks at 80mph? Check. I toyed with buying one in the late 2000s when the cars were £45k, but I could never have afforded the upkeep and TLC. What a memory, though. What a car. If you exclude the 350GT of 1964, that is. I tend to associate V12s with Ferraris, not to decry Lamborghini's ambitions. £350,000. I suppose that demonstrates its iconic status. "the 5.2-litre now produced 420hp." The Ferrari 456, with a V12, produces about 430 hp from its 456x12 cc and you can get a good one of them for one seventh of the price. With respect to values of cars emotion trumps logic. With respect to values of cars emotion trumps logic. Not really. It all comes down to preference. If your preference is maximum power output from an Italian V12 for minimum outlay, then yeah, logic dictates the 456 is the value proposition. If your preference is for a mid-engine supercar, then logic dictates the 456 isn't even in the discussion. I agree that a lot of cars look like terrible value these days. But that's because my preferences are different to most of those coughing up the cash! That engine bay has some extra gubbins in it, fuel injection system paraphernalia I think. I like your story; the 1980's were definitely the best time to be driving a Countach. It's not surprising though, is it- all those 14 year old boys with the poster on the wall are now at the age when they have their maximum purchasing power- hence the demand, and the prices. Yes - hence the iconic status. Also I expect the Lamborghini will be the better investment - I keep forgetting the a proportion of people wax-lyrical about n/a V12s and then never drive the cars. My dad had one of these. I drove it a few times - the drives were an "event" without doubt, but it was not a great car. It felt heavy and cumbersome. I remember we once drove it to some restaurant in a real bad blizzard. To get into the actual restaurant car park, we had to negotiate a lip in the entrance. Anyone who has ever driven a low riding car knows that these are always a bit perilous. I was asked to go out in the freezing snow, kneel on the ground and offer "advice". Being a stroppy teenager at the time, I was not best pleased. I may have closed the gull wing door a little harder than normal. But, honestly, not THAT hard. Needless to say, it was a quiet meal that night. that won’t cut much mustard on here pal, this happens to most of the TVR pilots on here when they hit 40mph. That's a US market fuel-injected car, with lots of extra emissions stuff on it. The rest of the world got 6 downdraught Weber carbs on theirs. Also it seems to be a current trend to paint the wheels of these gold. You rarely used to see that, but now Harry Metcalfe, Matt Farah and this one have all had it done. Are rear tyres made to that spec any more?? Can't be many manufacturers making 345/35/15 rubber and if there are they must cost a fortune! Great story from Ray! That would have been high-point of my year, wow.... Still would be, really. There was an EVO magazine special where Harry went to the Pirelli factory and went through the production process onsite working from the original specs. Apparently Pirelli still make them, but only in occasional batches. So if you think that you might need some in the near future then you have to buy them whenever they're available, because there might not otherwise be any left when you actually need them until they decide to make another batch..
Never drive your dream car. - "The Miura was, of course, the car that tied the knot between the firm and a dozen-cylinder engine way back in 1966." No, as mentioned above, the original 350 GT had a V12. The V8s came much later. - "the Miura provided Lambo with its technical formula for years to come"
You seem not to know that the Miura had a transverse V12 whereas the Countach and all subsequent V12 Lamborghinis have their engines longitudinally mounted (that's what the 'L' stands for in LP400). - "the Miura eschewed the rounded shapes of performance cars from its time"
Do you mean 'emulated'? or 'echoed'? 'eschewed' means the opposite of what I think you think it means! - "rear visibility in later cars was almost completely eliminated by the rear wing"
No, the rear wing makes virtually no difference to visibility. Have you ever driven a Countach? - "the boost was enabled by the use of six Weber Carburettors"
How many do you think the Countach (and Miura) had previously? - "located atop of the engine instead of to the sides for better cooling"
I don't think so; it's more to enable the engine to 'breathe' better. 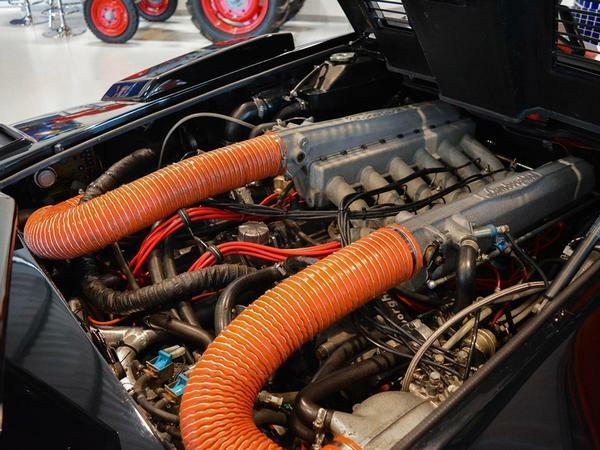 - "This encouraged the fitment of a raised engine cover"
I wouldn't normally nitpick like this, but there are a lot of Internet myths about the Countach and you should be able to get both your facts and your English right!